Publishers take note: This is the way to make a game from an established property on the Wii. Ubisoft has wisely recognized the need to innovate and try something different on Nintendo’s system. Consequently, despite the identical name, gamers are getting an entirely different game from the 360 and PS3 title coming out on the same day. While it’s by no means perfect, it includes a wealth of ideas that capitalize on the Wii’s capabilities. The result is a flawed but entertaining ride that elicits more creativity and critical thinking than any game in the Prince franchise to date. This Wii version of Forgotten Sands tells a lackluster story about the Prince and his involvement with a genie he purchased at a city market. She leads him to a kingdom of his own, but he’ll have to prove his worth first. The strange and jarring storyline feels barren of characters and motivation. It begins too abruptly, and events along the way feel like they’re there only to service the next stage of jumps and platforms. It’s a good thing those navigation sequences are so entertaining. The earliest traversals are simple affairs, but the following hours introduce new creation powers that add a new layer of freedom to the game and enable more adaptable exploration than previous games in the series. Summoning a hook to hang along the wall with a point of the remote, a column of air to shoot skyward, or a bubble of magical energy to hold a jump aloft, the Prince can improvise his own path. Later levels and hidden areas force players to formulate solution to ascending high, bare walls. The final few hours represent some of the most challenging and engaging sequences in the entire Prince of Persia series. Combat works fine, but the choice to use remote and nunchuk swings to govern attacks makes the whole system clumsier than it needs to be. The fights end up being a distraction from the meat of the game’s puzzles. It’s also worth noting that the game includes a simplified multiplayer component modeled on Super Mario Galaxy’s pointer mechanic. The second remote participates only tangentially, but it’s a nice way to bring in a spouse or child as you work together to solve the game’s visual landscape. Take this entry on Wii and place it beside the 360/PS3 game of the same name, and fans of the Prince have good reason to rejoice. 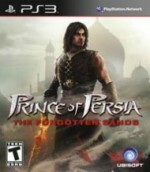 If you own the requisite systems, you’re getting two strong Prince of Persia games on the same day. If there’s one thing Ubisoft has done wrong here, it missed the chance to hype this Wii game independent of the entry on other consoles. Wii gamers have often been forced to make do with a substandard product for their less powerful system. This time, they get a great game built from the ground up to succeed. While the name may be the same, everything else is different in this deep and complex new franchise entry designed exclusively for the Wii.